I probably was crying behind my hands and under all that hair. Remember last month I got my hair tinted and blown out? O.k. so since then I've had a few run-ins with the heated appliances, I no longer blown out the hair if I'm going to manipulate curls, I just keep my hair curly and use the tools and ALWAYS use heat protectant but it doesn't mean the hair doesn't feel it and now the weather is changing, these curls are getting so dry, weeds and all can settle in my hair and find a patch and start to grow in my tumble-weed. Come on, the scalp was so tender and I've never been tender headed but the hair was so dry and just ew, the ends where it was tinted are starting to resemble bleaching now and I can't have that, I've spent way too long fixing this hair. I think I'm going to trim it cos I don't deal with crispy ends. 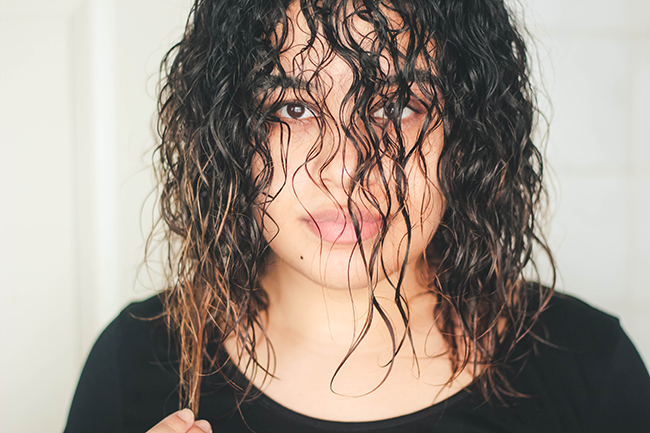 I have low porosity hair which means that water and moisture doesn't get into my hair strands easily but once it does get in, the hair is easy to manage. I find it's important to know your hair porosity level as it gives you an idea of the treatment that your hair needs. 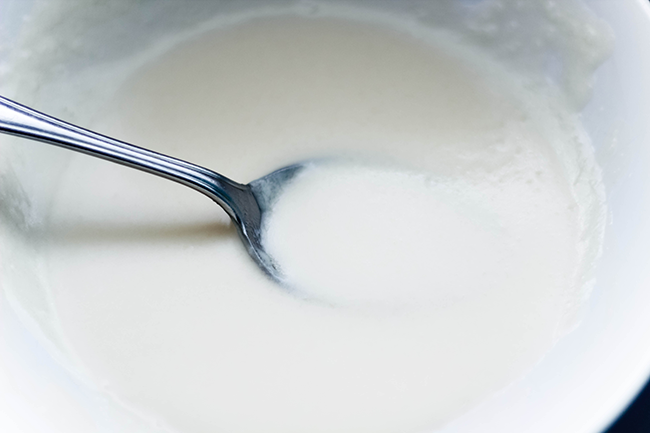 Enter the homemade treatment hair masque. I used this protein masque because as you can see the hair was very dry in touch and appearance and there is obvious damage, most of us know, not to kill our hair with protein, it already contains protein and we only need to up the dose when it's not appearing too good. Protein can do more damage than good if used too often. I've read horror stories about people's hair snapping. Go slow and steady. 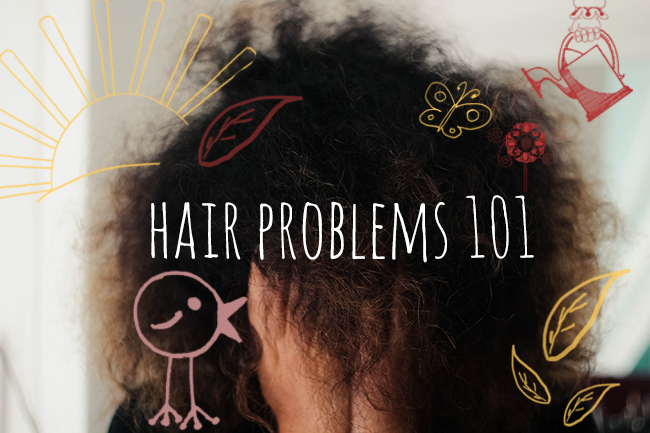 Seeing as my hair is low porosity sometimes protein treatments aren't good because it can make the hair hard and straw like, I've found that mixing it with oils and not doing it all the time - only when definitely needed doesn't hurt my hair. 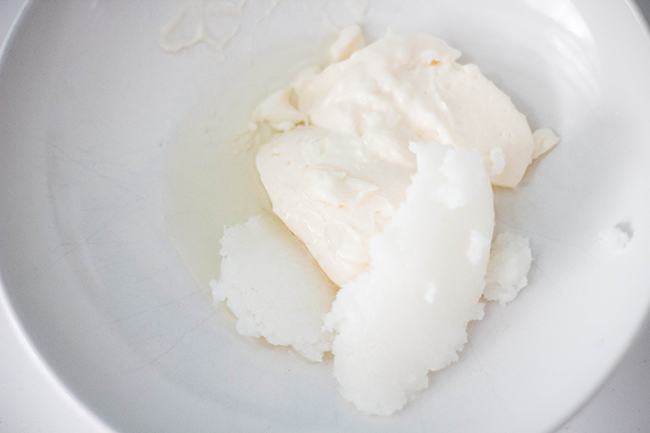 I make sure that I get all the lumps out of the coconut oil, make it a smooth concoction to slather onto my head. Taking care to get my ends soaked in the stuff. 3. Soak a towel in warm/hot water, wring it out slightly then wrap it around your hair you can then cover with a large plastic bag, clingfilm or shower cap and sit under a hooded dryer. -What I do is wrap it in clingfilm and put a showercap on and go about my daily doings and let the natural heat from my scalp, I use the clingfilm for two reasons more heat and of course I hate to feel anything dripping on me - urgh. Give or take about 30 minutes, I'll rinse it out. Start the rest of my routine of hair washing and I always make sure that my products for my final wash are aimed at curl activation, it's an important step for my hair as it gets the hair memory to remember, hello we are a defined bush. I know some low porosity people use baking soda with their shampooing stage ah I just don't know about that at the moment I think it might be too harsh for my hair especially with the already colouring process. That being said, I will use my ACV (apple cidar vinegar) but I only ever wash the scalp and allow the rest to follow down the hair shaft. No matter how dry the rest of my hair is my scalp still needs cleaning for the week. After my final rinse and before using my leave in conditioner. The hair already feels softer, not dry and wiry which gives me hope of keeping some moisture in for my next step. Whenever possible, air dry, I'm not against using a diffuser, as it evenly distributes the heat & the heat will allow my leave in conditioner to seep into my otherwise tightly sealed cuticles. It just depends on how bad the condition of my hair is at the time and the work that needs to be repaired - Sounds so confusing doesn't it. If I'm going to use heat just like when I'm air drying, I allow the hair to be damp - not dripping wet! Apply my creams and oils and carry on. Today I went with heat as the hair needs all the moisture it can absorb. I have some heat damaged ends (which is obvious in the picture above) and it's why I really want to stop with heat but I'm so scared to cut it off just because when those blow out times come, I might end up with a loop sided do, you know!? Except I bit the bullet and just did it, which will be my next post. Do you suffer from dry or heat/coloured damaged hair? 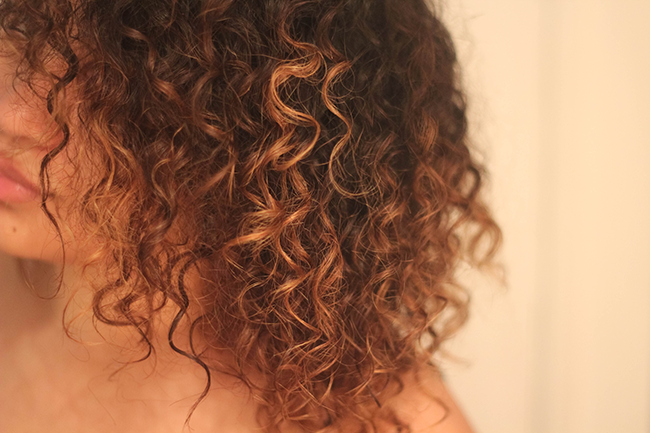 I love coconut oil, i think it really helps maintain the curls and prevents frizz! Just kidding babes but do go to the salon and get a trim. I'm going soon because for some STRANGE reason the hair at the back of my hair feels fried and yucky while the rest of my hair is healthy (0_o) . . . but we can swap hair!!! I should of gone and didn't lol just me, wine and some scissors. Yeah it's so crazy when just one half of the hair is off key, my left side is bouncy and curly and the right side is AWOL! My hair is so dry, coarse and prone to damage! I rarely heat style my hair but it still splits at the ends after a month between cuts. I know it's super cliche, but I am addicted to argan oil for my hair on the ends and even massaged into my scalp. That and coconut oil keep my strands somewhat happy. I also love Kiehl's deep conditioners. For some reason my hair just seems to respond well to their formulation.